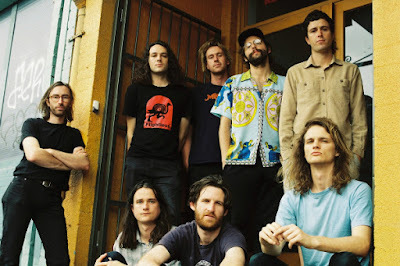 The Melbourne, Australia born Psych outfit King Gizzard & The Lizard Wizard tend to gravitate towards the far-reaches of far-fetched fantasy realms during apocalyptic pandemonium. That is to say their Melbourne roots aren't markedly apparent. From time to time their Australian upbringing reveals itself, but only in the stereotyped perception of the outback, a lawless wasteland where poisonous creatures and heat-scorched sand lay deracinated for miles on end. 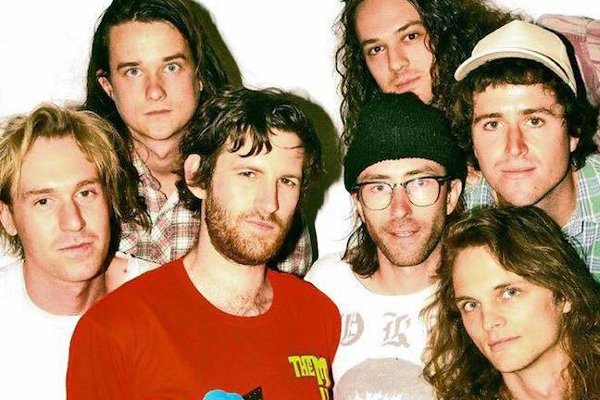 But King Gizzard, all born and raised in the vicinity of Melbourne, and specifically the suburb of Brunswick East, have never delineated their birthplace, perhaps as an inherent way to escape it. That unfounded belief changes with 2017's third album; Sketches Of Brunswick East, a travelogue of heartwarming Sunshine Pop that embraces the motherland and all its various quirks. With them, Mild High Club, a five-man outfit of Chicagoan outcasts exiled to the bleached and burnt strip of Los Angeles, a city where their temperamental Psychedelic Jazz fits merrily. The two bands, now in excess of a dozen members combined, collaborate for a record that, at least according to King Gizzard, envisions the vibrancy of Melbourne through a sound only possible had Mild High Club hopped on board. With the latter's sonic potency, the former's structural dexterity, Sketches amounts to a peaceful success. This, as followers of King Gizzard know all too well, pales in stark contrast to their previous efforts. In June, the group released their best project yet; Murder Of The Universe, a claustrophobic Psychedelic Rock opera foretelling doomsday. The blistering insanity just another notch in their discography that's quickly becoming overwhelmed with anomalistic ideas. Two months later, we've learned to expect the unexpected, as an almost assuredly momentary record composed of bright, harmless Pop melodies and Lounge instrumentals interjects itself amongst a freight train of cannibalistic deities. While my introduction to King Gizzard was through 2016's Nonagon Infinity, like most, it came to my surprise that this wasn't the first time they've attempted this. In 2015, Paper Mâché Dream Balloon infiltrated the Heavy Rock output with a record that sounds exactly as its title indicates. Even then though, their Beatles-inspired Psych Pop distanced itself from reality. Sketches does nothing of the sort, becoming one with the bustling streets of Brunswick East in their most down-to-earth record yet. If it weren't for a Han-Tyumi appearance on 'Tezeta,' or Flying Microtonal Banana pleasantries on 'D-Day' and 'The Book,' the discography-long concept of Armageddon would be nonexistent. Sketches itself does a (presumably) fantastic job imitating the virtuous childhood of sheltered Melbourne teens around the turn of the century, and much of that, surprisingly, can be attributed to Mild High Club. While last year's Skiptracing merely breezed my interest, the brisk, impressionist nature by which that album exists permeates through Sketches various, pop-up corners. In fact, with Stu Mackenzie's detectable absence, Alexander Brettin taking the place, there's barely a trace of King Gizzard's iconic sound. Melodic Jazz weaves through the three-part title track like a stop motion car traveling through an alternate cartoon universe, one where Cut Chemist's '2266 Cambridge' beams to the surface. Birds chirp, kids yelp, sirens screech, and cars honk not as intimidation but as a friendly hello. Sketches lives through this quaint suburb from beginning to end, existing so cautiously at times that Sesame Street may be an apt comparison. That, or the peaceful tranquility of Katamari Damacy, a cult video game that glowed with the same light as seen on the cordial 'You Can Be Your Silhouette.' The warmth of Mild High Club's sound a necessary commodity, as their impact soars higher than King Gizzard's own. It's a testament to the latter's tact, supplementing their aggression for another band's affection. Tattered remains of the Australian outfit's style surfaces throughout though, mostly in the form of linear progression and structural transparency. On Skiptracing, Mild High Club worked through singular constructs, like most musicians. But if Murder Of The Universe or Nonagon Infinity taught us anything, King Gizzard relishes in sustainable transmutations. Many songs here seep into one another, undetectable to the distracted listener. This can best be seen on Sketches first two lyrical cuts; 'Countdown' and 'Tezeta,' which lead into the instrumental 'D-Day' and 'Cranes, Planes, & Migraines' respectively. The former dazzles in melodic trance, embodying the album's Neo-Psychedelia vibrations, while the latter tantalizes with unnatural tonal shifts, both beautiful in their own right. On 'Countdown,' or even the crackling resonance of 'Rolling Stoned,' influence from Indie music's favorite Australian band, Tame Impala, can be heard. This, a first for King Gizzard, and while the execution is admirable, I'd prefer a bit more over-the-top eccentricities, rather than relying on Mild High Club's redundancies. While it's difficult to convey Sketches' missteps, the album's overall flightiness doesn't hanker to be anything more than a Sunday afternoon stroll. It's a fundamental stopgap between the insanity of what came before, and what will come after. This works when realizing their beyond-hectic 2017, as a retreat to the amicable confines of Brunswick East a compulsory decision to bathe the blood, sweat, and vomit off Indie's hardest working musicians. Sketches savors its relaxed atmosphere, content tapping along to the cities tremors on the stoop. Out of the 13 songs here, only seven feature vocals, imparting a great deal of imagination to the listener. Unfortunately, a lot of these junctions fail to entice, including the intro, interlude, and outro of the title track, which breeze by as improvisational Jazz without a knack for the finer details. That doesn't apply to 'A Journey To (S)hell' though, as the extended commotion following 'The Book' frantically hustles through an arid wasteland, taking Sketches far from Brunswick East momentarily. These two tracks, especially 'The Book's' clear biblical condemnation, borrow heavily from King Gizzard's catalogue, a problem seeing as they stick out like a sore thumb. Together as a duo, they're great. Sandwiched between the barking dogs and chirping crickets of 'Dusk To Dawn On Lygon Street' and the serene Toontown of 'Rolling Stoned?' Not so much. Nonetheless, Sketches Of Brunswick East provides fans with yet another angle of King Gizzard's ever-evolving palate of creativity. They're the band that knows no bounds.